Sansuien is a traditional Japanese ryokan and spa in a quiet natural environment surrounded on three sides by mountains. In every season the historic architecture, the surrounding natural beauty and abundant hot springs and a Japanese menu of carefully selected ingredients provide a place where both mind and body can be refreshed. Sansuien is blessed with three high-quality spa sources offering a balanced, fresh natural hot spring at a temperature that does not result in chemical breakdown. The simple sulfur spa-quality alkaline spring warms the body to the core. This is helpful to people who suffer from such conditions as neuralgia, rheumatism, cuts, or skin trouble. This hot water spring is considered one of the best in Japan. We hope you will enjoy it. We do not hesitate to offer the water of this hot-spring even to people who are not staying at the ryokan. Please enjoy the hot water overflowing in large tubs including an open-air bath. 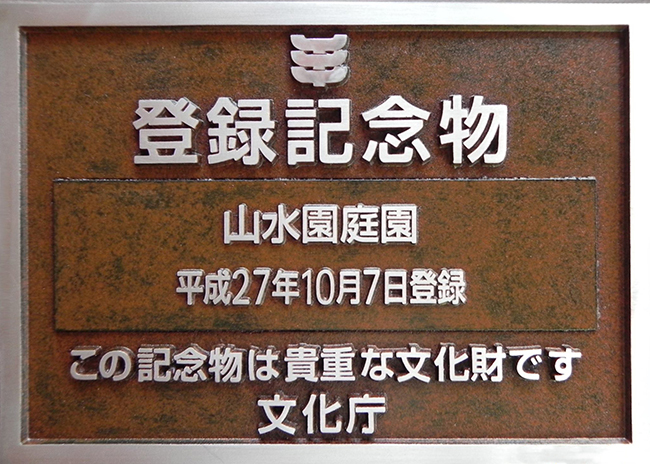 In 1956 and again in 1963 the Emperor and Empress Showa made short stays here. The two adjoining rooms, Paulownia and Plover (now designated as 行在閣, Anzaikaku, a place where the Emperor rested) overlook the integrated Japanese scenery of the gardens and mountains. Four tea rooms and a preparation room were constructed according to the plans by Sukiya and Usui Kaichiro (笛吹嘉一郎). In particular, the Sangetsu (Mountain Moon) tea room was built as a representation of Omotesenke tea house, Zangetsutei in Kyoto. The thatched gate in the garden entrance, is a copy of the Ibaraki Gate of the Nara Jikou Temple. On the second floor above the gate is also a tea room designed by Usui Kaichiro. The lobby, built in 1945 and added to in 1963 conveys a fusion of romantic antique atmosphere of the Taisho and Showa eras. Now a computer nook in the library corner of the lobby enables internet access. 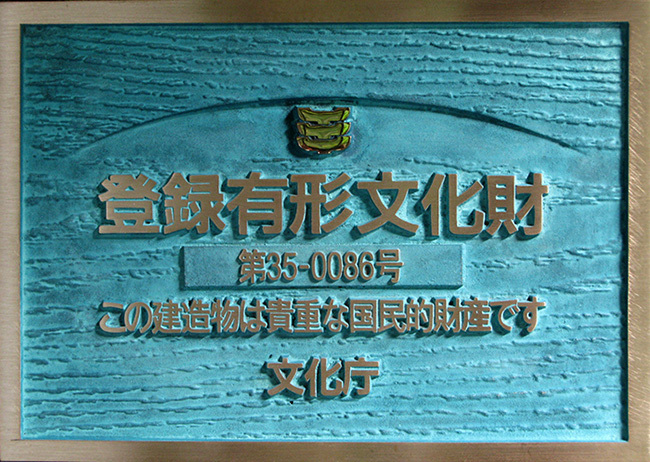 The building and gardens that welcome so many guests, are considered to be so excellent in materials and architecture, and the people involved from the craftsmen to the ryokan staff such excellent representatives of this region and Japan that Sansuien has been registered as a national tangible cultural property. We commit ourselves to the cleaning and care it takes to preserve this wooden structure so that over time customers can continue to stay comfortably and to pass this building on to future generations. We have three modes of Japanese garden, each of them officially registered as “National Treasures.” The Chisen (pond) garden, Karesansui garden, and roji (tea house garden) are skillfully placed so that you can enjoy flowers and fresh green-colored leaves of the four seasons. The three gardens, though continuous, have also been highly evaluated as independent gardens. A stroll around the Chisen garden reveals it as the work of the Taisho period. The dry garden and flowering tea house garden, was the handiwork of Kyoto gardener Goto Juuei circa1945. Garden with its scenic mountain backdrop, necessitated integrating our buildings strategically to create a high-quality space. We will continue to maintain this good scenery, and we hope to better create an environment that maintains a healing space. The cherished taste and ingredients of Japanese cuisine are now registered as an intangible cultural heritage by UNESCO and gaining attention from the world. To preserve this original Japanese tradition and taste, we use only the freshest and safest ingredients with a focus on local production, cooked with loving care. Warm dishes are served warm, cold dishes served cold, according to your taste, to bring a sense of joy to your palate and bring a smile. Relax and enjoy our traditional Japanese meals. In Rin sui (臨水), you can enjoy reasonably priced traditional cuisine or Japanese-style meat dishes and the like. Stop by when you use the spa or take a garden stroll and spend some relaxing moments in this stylish hexagonal building (open for lunch only) overlooking the pond and garden. For announcement of new dishes and seasonal menus, as well as the information about events of the season such as the Cherry Blossom Festival, please check the bulletin board in the Inn. ©Copyright 2016 Yuda-Sansuien All rights Reserved.